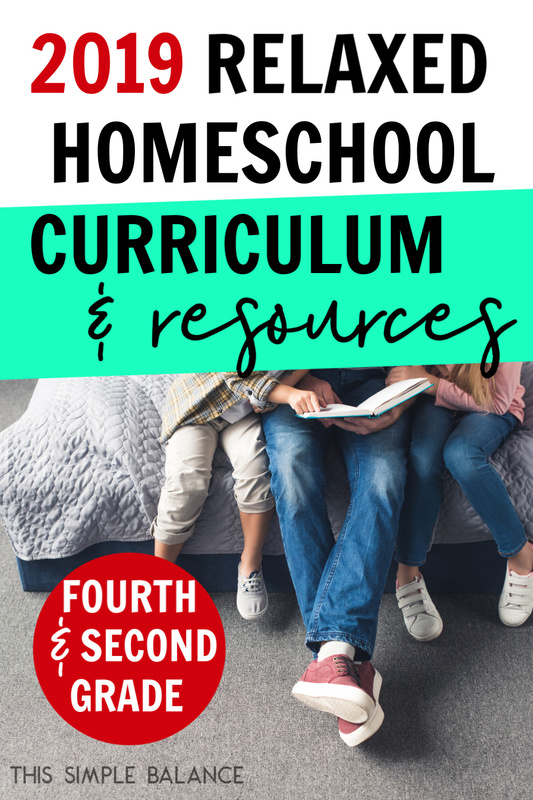 Inside: Get ideas for how to homeschool 4th grade, including 4th grade homeschool curriculum and resources for every subject, as well as a sample weekly routine. Where we live, spring is finally starting to show itself. And when spring shows up, all the homeschool moms seem to automatically start thinking about next year’s curriculum and plans (even though it’s six months away). What curriculum and resources are working for us? What are we going to toss? What are we going to keep? If you’re starting to ask those questions and you’ll be homeschooling 4th grade next year, this post is for you. You may also find our plans helpful if you are trying to choose curriculum and resources that can be used for multiple kids of different ages. So even though it’s a little early, I’m going to share what I am planning to use next year to homeschool 4th grade (along with 2nd grade and kindergarten-ish). Hopefully our list will help you with your homeschool planning and curriculum buying! But before I jump in, I wanted to emphasize that a new year doesn’t necessarily mean you to change anything. Most of what I’m sharing is consistent with what we’ve used the past 2-3 years. If you’ve been homeschooling more than a year or two, it’s easy to get shiny new curriculum syndrome, thinking that something new will solve all your homeschool woes. News flash: it probably won’t. Oh, it might appear to be just what the doctor ordered…for a few weeks. And then all the same problems will come right back after the novelty has worn off. So be careful about jumping to something new if you’re frustrated with your current curriculum. Sometimes it IS time for a change. But sometimes the problem isn’t the curriculum – it’s something else. Keep that in mind as you read this post. By the end of October, we will have a 10-year-old, almost 8-year-old, 6-year-old, almost 4-year-old and a 9-month-old. And I admit, juggling everyone has become more challenging. Baby-wearing is a must (this is my favorite carrier that I’ve used for four babies so far), as is squeezing in intentional, planned-by-me learning ANY time everyone is seating, calm, or quietly occupied with something. Wondering how often that happens? Yeah, me too…. In all seriousness though, I’m a relaxed, minimalist homeschooler. 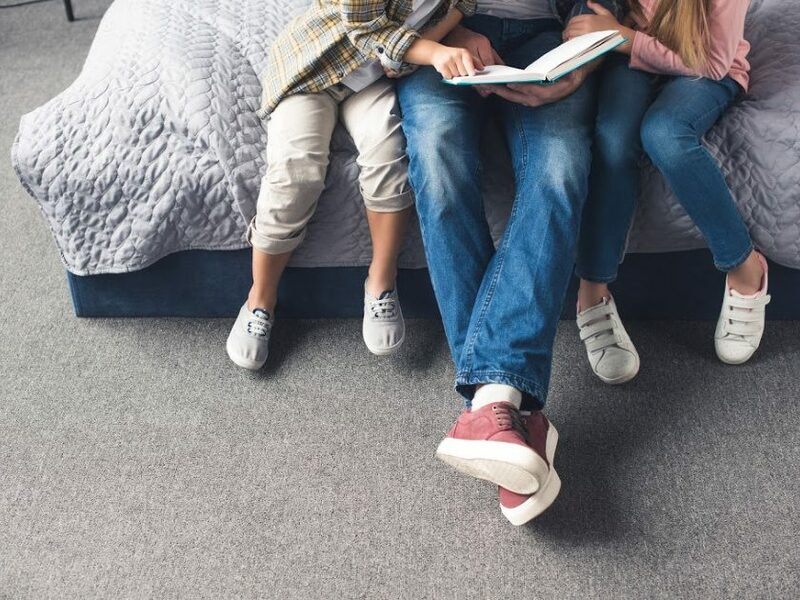 Initially, adopting this homeschool style was a matter of necessity – life with lots of littles under age 7, plus working from home, meant not a lot of formal school was happening. Over time, however, I’ve come to love our homeschool style. I truly believe that homeschooling can be a lifestyle. 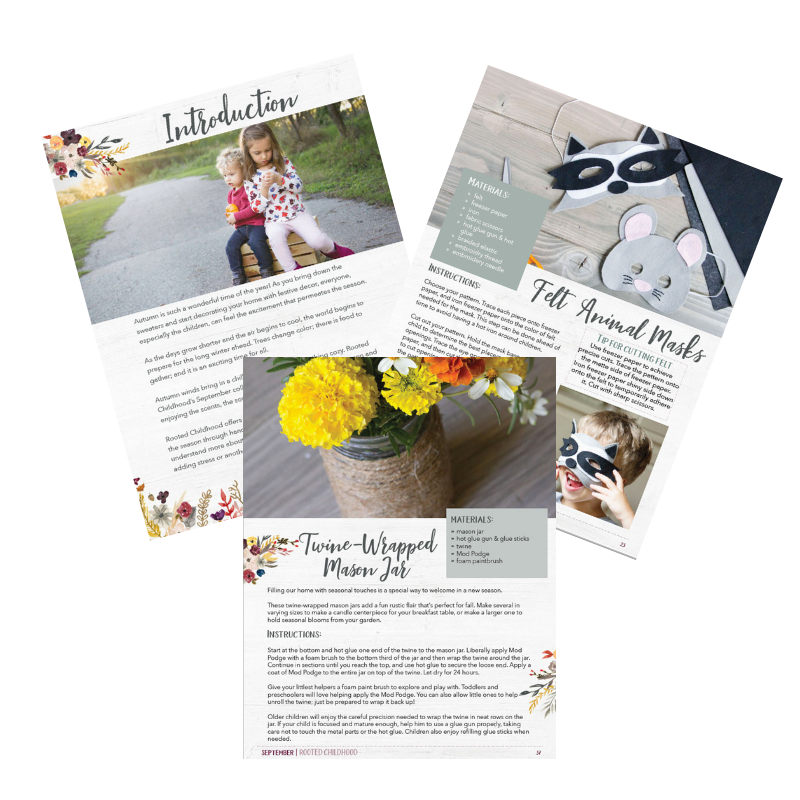 If you love a more structured homeschool style that involves more than a couple hours of formal school work every day, and it’s working for you, awesome! 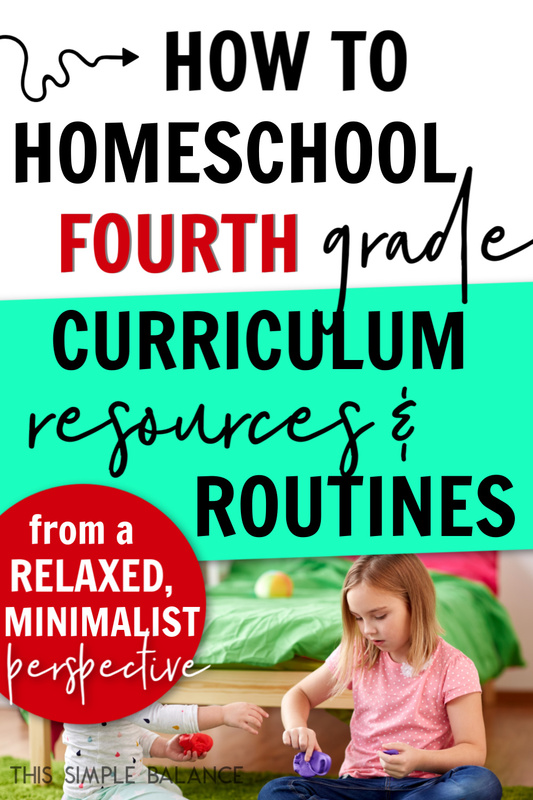 But if homeschooling feels way too hard and a constant source of frustration, I strongly encourage you to check out this book on minimalist homeschooling. You CAN do less in your homeschool, as long as do less with purpose. Here’s the big long list of curriculum and resources I plan on using to homeschool fourth grade this year. For language arts, we use Brave Writer almost exclusively. If you’re unfamiliar with Brave Writer, you can read my honest review HERE. I used to be skeptical about Brave Writer, but having transitioned to relaxed homeschooling, I now love this program. The program teaches writing in a completely different way than schools teach writing. And if you’re skeptical, hear this from someone who now earns a living writing: I had to completely unlearn my very stilted, academic writing style in order to make this blog a success. Because I had to work so hard to change my own writing style, I want my kids to learn from an early age how to write about what they’re passionate about. Even the editing process, she is motivated to go back and make her stories better. I realize this might be unique to her, so as the rest of my kids get older, I may need to be more intentional with implementing certain aspects of the Brave Writer Lifestyle . (Get the full list and tips to implement the Brave Writer lifestyle HERE). I am going to try one of Brave Writer’s Arrow Guides this year as well, just with my 4th grader. Look for a review in the future! This year, my focus with reading will be to nudge my 4th grader back to reading physical books. She gravitated towards audio books this year, which is great. It allows her to listen to books potentially above her reading level and enjoy them. She is still reading physical picture books, reference texts, and various other forms of reading required for everyday life. Chapter books quickly dropped off the reading list. My current plan is to encourage her to read the books in various series that are not available on audio book. Hopefully, her curiosity will be piqued enough to pursue the physical books. We will continue reading aloud almost every day. We are slowly making our way through the Anne of Green Gables series. I do not teach formal spelling because for a 4th grader, she is making great progress simply by teaching herself through writing. The difference in her spelling in the past two years is astonishing. Her spelling at age 7 was absolutely atrocious, to the point where I was seriously considering implementing some kind of spelling instruction. But after a lot of reading, I decided to trust the process and continue to let her learn spelling through writing. This method can feel burdensome initially. You’ll feel like you’re answering “How do I spell” questions every day, all day, ad nauseum. That stage didn’t last forever, and it was far less painful that assigning arbitrary spelling lists every week. Two years later, she is a fairly confident speller and continues to improve. If you are noticing that your fourth grader is not progressing in spelling, the advice I’ve received from other experienced homeschool moms is to wait until age 10 or 11 to start formal spelling. If at that point, it’s evident you do not have a natural speller on your hands, you can use All About Spelling or Phonetic Zoo (or both) to “catch them up”. At that age, they will fly through the curriculum and learn spelling far more quickly than had you plodded along for several elementary school years. Up until now, I haven’t worried much about grammar either. The majority of proper grammar can be learned conversationally. In writing, it’s another story. And I’ve come to the conclusion that you need to learn the “rules” before you decide to break them. So this year, we are going to start slowly working through Grammar Galaxy. It reminds me of Life of Fred Math in style, and since we love Fred, I figured it would be a great fit for us! I will write a review later this year to let you know it goes. 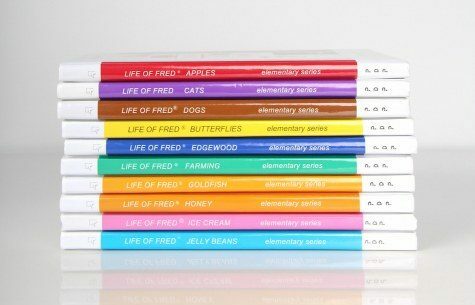 We will continue to use Life of Fred for math this year. We are about ¾ of the way through the elementary series. I plan on reading aloud two chapters a week to my 4th grader, 2nd grader, and kindergartener. We usually work through the problems together, and I add problems so that everyone gets a chance to practice at their own levels. You can read my full review of Life of Fred HERE. We will also work on memorizing our addition and multiplication facts. I purchased these tools, which we are excited to start using soon. Proficiency in mental math is non-negotiable for me. As an adult, I rely on quick mental math in so many ways. I want to find more fun ways to practice math facts as rote memorization is not my favorite method of instruction. While I do love Life of Fred, I like to supplement our reading with workbooks. We do “workbook Wednesdays”, and they can choose any workbook to work on. For math workbooks, we use Brain Quest (Grade 4) and Math Skillbuilders for homeschool 4th grade math. We are finishing up the second book in the Story of the World series. I personally love history, so this is probably my favorite part of our homeschool day. For 4th grade, I plan on completing the last two books in the series. We will move on to American History in 5th grade. In preparation, I’m on the hunt for a resource for American History that reads similar to Story of the World. Investigating this series on American History is on my to-do list this year. This month, my daughter expressed a desire to study geography more formally. I did some research and purchased two resources: a world atlas for kids and a world map coloring book. In addition to these two resources, we will purchase another year of Little Passports World Edition and continue to use it in conjunction with this online resource guide. For more details on how to use them both together, see this post. I continue to take an interest-based approach to Science. We learn through nature walks with our local homeschool group, answering questions as they come up, educational TV shows and Youtube Channels, and science experiment kits. Our current favorites for learning Science are Wild Kratts and SciShow Kids Youtube Channel. We used to simply watch the seasons available on Amazon Prime (Seasons 1, 2, and 10) in addition to new episodes on the free PBS Kids app. Then last week, we discovered that you can access all the seasons and Wild Kratts full-length videos on Amazon Prime when you subscribe to the PBS Kids channel! It’s $5 a month, but you can get a free 7-day trial HERE. Head HERE to sign up for your free trial. Because so many homeschool bloggers I know rave about it, I signed up for Curiosity Stream this year. At $20 a year for commercial free documentaries, it seemed like a no-brainer. But honestly, I’m still undecided about whether we will keep using it. A lot of the content is designed for older kids, and I don’t feel awesome about them watching it unsupervised yet. Have you tried Curiosity Stream? I’d love to hear your thoughts! We have tried various science experiment kits over the past few years. We enjoyed the Magic School Bus Science monthly kit. It was the perfect fit for my kids at ages 8, 6, and 4. Last year, we tried Little Passports Science Expeditions and loved the more in-depth experiments and explanations of the science behind them. This year, we tried Steve Spangler’s science box, and I wasn’t impressed. The boxes seemed age appropriate for 4-6 year-olds only. They were more like activity boxes than science boxes, in my opinion. The activities were fun, but not enough science for me OR the kids. We will be returning to Little Passports Science this year. In the photo below you can see an example of one kit where we built an elevator to learn about pulleys and weights. Learn more about Little Passports Science Expeditions HERE. The kids do various self-designed art projects, but we also do formal art lessons through an online membership to Masterpiece Society. With a membership, you get access to everything they offer. Try a lesson for FREE using this link. Currently, we are using the K-2 Elementary classes the most, which are mixed media projects involving mostly chalk pastels and watercolors. Last year, we attempted some of the more advanced projects and realized they weren’t age-appropriate. We will try again this year. The yearly membership opens a few times a year for a week at a time. This week (March 19-26), you can purchase the full membership. Individual classes can be purchased year-round. We are also trying Rooted Childhood’s handiwork crafts this year. I’ve heard so many good things about them, so we are excited to try a few projects this year. I love outsourcing art! Other than buying supplies, it’s a fairly hands off subject for me, which gives me time to work, take care of the house, or take care of the younger kiddos. Going into our fifth year homeschooling, I am (finally) confident in my homeschool style and approach. I also can finally say that I love how every week – and every day, for that matter – in our homeschool looks different. Three years ago, I was pulling my hair out trying to stick to some kind of homeschool schedule. I was angry a LOT of the time. I felt like a homeschool mom failure because I couldn’t get even the most basic schedule to stick. Our lifestyle doesn’t lend itself to schedules. I share one car with my husband whose work from home days are unpredictable. We also live in a state where the weather changes dramatically from week to week. With so many little ones whose needs and schedules change rapidly, I really had no desire to work at getting the kids used to one schedule only to have it change a week after they finally had it down. Kids don’t necessarily need as much schedule/routine to thrive as all the “experts” claim. Most of those experts are writing from a western-based worldview and perspective. While we do have a morning and evening routine, we don’t have daily routines, though I do try to stick to a weekly homeschool routine. I also know that my 4th grader still needs a lot of play. While we will likely enroll her in a weekly extracurricular activity in the fall solely for social purposes (there don’t seem to be many homeschool 4th grade girls in our area), I keep our schedule free for the most part to encourage free play and interest-led learning. Mondays are mainly dedicated to resetting our house. The kids take on various paid jobs, which we negotiate based on personal preference and what works for me. We will also make plenty of time for unstructured art projects, in addition to an art class or craft. We will read one chapter of History as well. Tuesdays, we focus on math: Life of Fred and math practice. We may or may not fit in another chapter of History, too. Wednesdays, we have “workbook Wednesdays” where the kids work for 30-45 minutes on the workbook of their choice. We also do poetry teatime on Wednesdays. Thursdays, we read History and another chapter of Life of Fred. Our Wild & Free homeschool group also plans nature walks twice a month on Thursdays, which we attend. Fridays, we dedicate to reading aloud from our library books and gameschooling. I set aside the morning to read to the boys and play board games with everyone. On a daily basis, we read one chapter a day of the Bible and discuss it together. I try to make time for spending time with God together 2-3 times a week as well. The kids watch a science show together almost daily, and we complete any subscription boxes as soon as they arrive. Other subjects we fit is as we have time and motivation. In this post, I specifically focused on how to homeschool 4th grade because we do the majority of our schoolwork together at this point. The only resource I didn’t mention is the reading program I love and use with my second grader. We are still slowly working our way through it. We read together 2-4 times a week, depending on what else is going on that week. You can read my full review of I Can Read It! HERE. The rest of our learning happens through play, listening to audio books in the evenings before bed, answering spontaneous questions, and just LIVING LIFE. The kids are free to pursue their own interests during the day as well. One of my highest goals for my kids, and my primary reason for homeschooling, is that they would know themselves and know what they love to do. I want them as adults to know what they love to do, get good at it, and be able to earn a living based on that passion. Obviously, they probably won’t love everything about their jobs, but I want them to mostly love what they do. Then the stuff they don’t love, but is necessary to do their jobs, they will do because it serves their higher purpose of work they love. Fourth grade feels so old! I honestly can’t believe I’ll be homeschooling a 4th grader. At the same time, fourth graders are generally 9 and 10. They are still young; they still need so.much.play. Just today, we read our Story of the World chapter, which contained abridged version of Hamlet. When we finished, my soon-to-be fourth grader built a video camera and microphone with LEGO. She taped the headset to her face and started interviewing everyone, asking what they thought about the story. I watched her and tried to remember what it was like to love playing pretend. I only ever remember playing “teacher”, which is how I earn an income today, teaching through this blog. As our kids play, they are “trying on” adult roles, considering what it’s like to be a reporter or a writer or a teacher. Pretend play is vital to their development, and in our society, we cut them off way too soon. I constantly remind myself that Anne in Anne of Green Gables played pretend with her friends long into her teenage years. I want my kids to do the same. So as you homeschool 4th grade, remember that childhood doesn’t last forever. Whatever your plans, make lots of room in your days for play. Because they truly do need it, and the best play happens when you don’t need to worry about the clock. Miss last year’s curriculum and resource post? See what we used to homeschool 3rd grade HERE.